Shredded chicken is incredibly versatile, it can be stuffed in samosas, pastries, tacos, marinated in BBQ sauce, rolled up and so on. 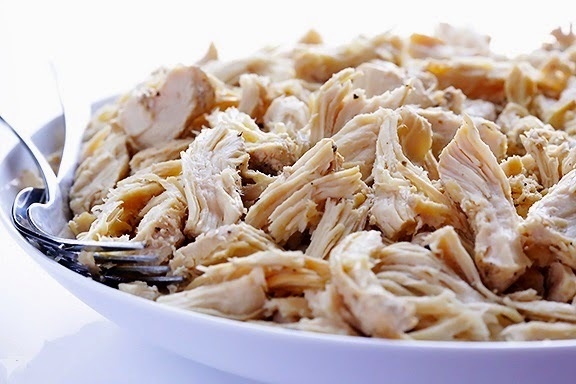 To me this really isn't a recipe, but I was telling a friend how I make shredded chicken for recipes and she said I should post it. It always comes out tender, I usually make double at once since it is so easy. In a wok sauté chicken with salt in oil and let it be slightly golden. Add remaining ingredients and water and simmer on low heat for 15 minutes. when the water has been evaporated, shred the cooked chicken with fork or a masher.